Smoke filled the skies of California, but it would take more than that to stop us from playing the 2018 AA Fall Championship Game! One team is new to the league and went undefeated in the regular season, while the other had come up just short in each of the last 2 championship games. 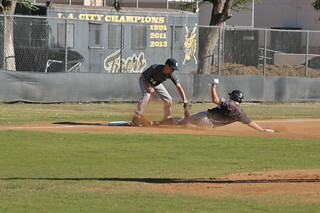 This was sure to be an exciting day, as the 9-0-1 SBAFunds.com Wolves faced off against the 8-2 Berserkers. 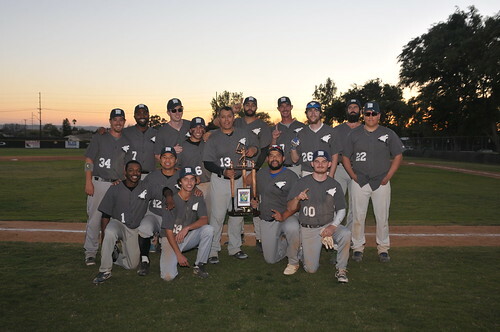 The Wolves won their only regular season meeting 3-2, but the Berserkers scored the most runs in the league and allowed the fewest. Who would take home the trophy? Let's find out! 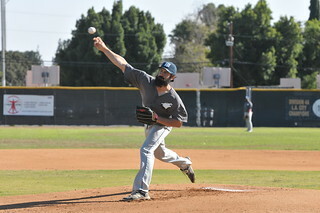 Clark Cuthbert took the mound for the Wolves, and after a quick strikeout, the Berserkers offense came to life. Nick Koontz walked, and AA MVP Johnny Lopez was hit by a pitch. Koontz was erased trying to steal, but Mickey Anderson walked and Dan Sloan singled home the first run of the game. Michael Johnson hit a sinking liner to left that was dropped for a 2-run error, and after a half inning in the books, the Berserkers had a 3-0 lead and Cy Young winner Michael Maglione headed to the hill. Kyle Samuel led off for the Wolves with a single. Walt Roberts followed with a single, and Kenny Mickens ripped a grounder down the third base line. Berserkers' third baseman Mickey Anderson snared the ball and took it to the bag for a web-gem force-out, but Shane Brando cashed in the Wolves' first run on a single. Darryl Simien grounded into a fielder's choice, but Ryan Childs kept the inning alive with a wind-aided single over first base that JUST stayed fair, plating another run. 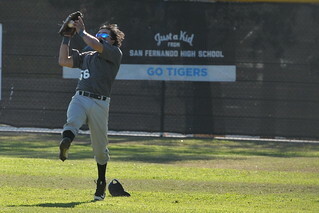 Charlie Fernandez belted a 2-run double to left center, and Nolan Draves doubled home Fernandez. All told, after 1 inning and 40 minutes, the Wolves led 5-3. Cuthbert worked around a pair of walks in the second, and the Wolves' offense was back to work. Shane Smith singled to center, and Kyle Samuel reached on an infield single. With 1 out, Kenny Mickens singled to right center, and Shane Brando his a bases-loaded sacrifice fly to bring home Smith. A passed ball and a wild pitch scored Samuel and Mickens, as the Wolves extended their lead to 8-3 after 2. Another quiet inning from Cuthbert, and the Berserkers brought in Nick Koontz to pitch. He escaped the third in 5 pitches, with the Berserkers trailing 8-3 after 3. Berserkers Daniel Sloan led off the 4th with a triple to deep right, and after Michael Johnson walked, the Berserkers looked to be in business. But a line-drive double play at first ended the rally, and Sloan was stranded at 3rd. With the momentum still on their side, the Wolves put together a monster inning to take control of the game. Kyle Samuel led off and reached on an error, then moved all the way to second on an errant pick off, and again to third on a second errant pick off. Walt Robers walked, and Kenny Mickens singled him home. Shane Brando and Darryle Semien were both hit by pitches to load the bases, but a ground ball led to the first out of the inning (at home.) Charlie Fernandez followed with an rbi single, and Nolan Draves singled home 2 more. Angel Rosal walked, and Fernandez scored on a wild pitch. Snahe Smith walked, and pinch hitter Edwin Soto grounded into an rbi-fielder's choice. The Wolves batted 12 in the inning, and after 4, had a 15-3 lead. The Berserkers weren't done playing ball yet, and continued to fight. In the 5th, 4 straight 2-out walks to Jayson Saldana, Art Castaneda, Nick Koontz and Johnny Lopez plated 1 run and chased Cuthbert from the game. But Brandon Gordon came in and stopped the bleeding, with the Berserkers now trailing 15-4. In the 6th, Dan Sloan led off with a single, and after moving into scoring position with 2 outs, Anthony "Beef" Saldana singled him home. Tom Stanley followed with a single, and Nick Lavin walked to load the bases and chase Gordon from the game. Walt Roberts came in, but was rudely greeted by Jayson Saldana's 2-run single, cutting the lead to 15-6. 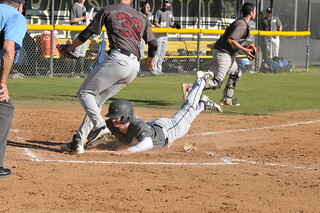 In the bottom of the 6th, Ryan Childs reached on a fielder's choice and eventually scored on a Charlie Fernandez single. But the Berserkers answered right away in the top of the 7th. Nick Koontz led off with a walk, and Johnny Lopez reached with his second hit by pitch. Both men moved up on a wild pitch, and when the throw went down the left field line, Koontz scored. 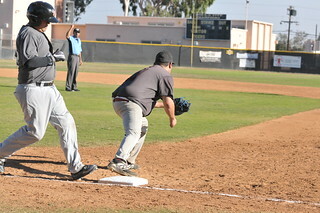 However, Lopez was called out at third on a head's up throw from the Wolves' left fielder for the first out. Mickey Anderson and Dan Sloan eached walked, and Michael Johnson singled to load the bases. With a 15-8 lead, a big hit here would bring this game back into reach. But a hard hit grounder to second was turned into a momentum shifting 4-6-3 double play, limiting the damage and keeping the score 15-8 mid-way through the 7th. Fast forward to the bottom of the 8th. With the skies growing dim, neither team wanted to have the game called due to sun light. Kyle Samuel singled and took second on a passed ball. Walt Roberts walked, and Kenny Mickens hit a slow roller to short and beat it out, but a bad throw plated 1. Darel Simien walked, and a wild pitch plated another and moved the mercy-inducing, walk-off run to second. Ryan Childs came through, with a ground ball up the middle, plating a pair, putting the mercy in place and walking off with the championship! Enough can't be said for the fight that the Berserkers put up. 1 inning swung this game, but they didn't give up and fought all the way to the end. Congratulations on another great season! 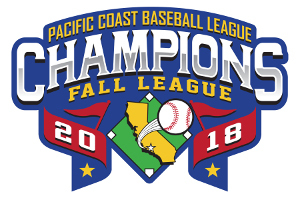 But this day, and this season, belonged to the SBAFunds.com Wolves - your 2018 AA Fall Champions! Congratulations to the 2018 AA-Division Champion SBAFunds.com Wolves!